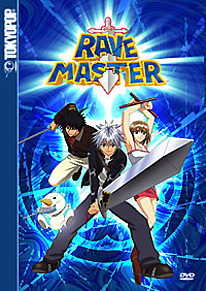 Rave Master 1-3 as a special Limited Edition 3 DVD set! Fifty years ago, an epic war raged between the forces of light and shadow, ending with a massive explosion that scattered the light’s precious Rave Stones throughout the world. Now, young Haru Glory, the new Rave Master, must journey to uncover these legendary Rave Stones, the only force powerful enough to defeat the evil of the Shadow Stones. Armed with the magical Decaforce Sword, Haru joins forces with Elie, a spunky girl trying to remember her forgotten past, and a lovable creature named Plue. Together they attempt to unlock the secret to the destiny that has brought them together. It is a journey of heroism and self-discovery. It is the adventure of a lifetime..